Now, with 100% more blocking! The question always comes up – at which point does one block a handknit sweater project? After all pieces have been knit, but before seaming? What about the cuffs, button bands, collar, hood, etc.? Sometimes those finishing elements can only be attached after seaming. Maybe the sweater in its entirety should be blocked? Or re-blocked? There is no simple answer, and no single solution to this question. My personal preference is to block individual sweater pieces whenever possible, just because they’re easier to handle. It’s also a way out should something unpredictable happen. What if your knitting grows in length much more than indicated by your swatch? It’s difficult enough to redo the upper portion of 4 or 5 individual pieces of knitting… imagine having to rip out the seams first. (This, by the way, is the reason I prefer to knit sweaters in pieces: front(s), back, and sleeves). Or what if there was a problem with one of the skeins, and the inconsistency showed up only after washing? I’d much rather contemplate replacing the offending portion of knitting without undoing all the seams first. (Another argument for knitting sweaters in pieces). But sometimes a little seaming before blocking is inevitable. I might be working with a yarn and/or pattern which doesn’t look good until blocked, or changes its shape/texture dramatically upon blocking. Then the collar, button bands, etc. will probably need to be blocked, too. In those cases, I’d join the minimal number of seams necessary for the collar to be added, knit the collar, and block some front-collar-back hybrid, much like you see in the photograph above. Or I’d block the pieces individually, seam the sweater, attach the collar, and spot-block the newly-attached elements with the help of a spray bottle or careful dipping into a basin of water. In the particular case of the Brilliant Retro, I joined the fronts to the back before blocking: there were long strands of yarn at the shoulders, left there for the purpose of doing 3-needle bind-offs. I didn’t want to leave them dangling (and tangling) throughout blocking. I suspended the fronts-back hybrid on two of those sweater dryers placed side-by-side: handknit pieces definitely dry quicker when air circulates all around them. 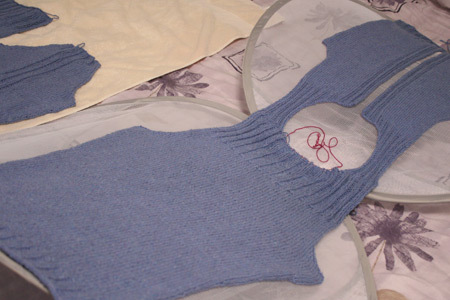 The sleeves were blocked without any seaming. I will be attaching a collar post-seaming, but I don’t think I’ll need to block it – this yarn knits up pretty evenly, and doesn’t change much when wet. If I do decide to block, then I will wet it with a spray bottle. The collar isn’t the only finishing element in this sweater – there’s a zipper to worry about! But look at those edges: they are neat and tidy, no further knitting required! You are a great advocate of “knitter’s choice!” I heartily concur — what’s right for one project isn’t necessarily going to work for every single other project. Brilliant Retro is looking, well, brilliant! I like the ribbon idea–so cute! I totally agree that knitting 2 19-inch long strips is the last thing anyone should do. Thumbs up on the ribbon idea, it will make for some great contrast with the project. Nice work! Windsor Button is a local source for colors of grosgrain if you need it handy, but those are pretty. Hmmm, am I making anything with steeks soon, I wonder? Those sweater dryers look like such a great idea! My Grandma Frances, who at the age of 96 is still knitting (mittens for charity–dozens of pairs a year), always used grosgrain ribbon for button bands and zipper facings. With weighty buttons or a very soft knit, the grosgrain added a great deal of structural integrity to the button holes. If you do ever try it on a button band, you’ll want to find a pair of buttonhole scissors to make your life much simpler. The sweater looks great so far. I’m looking forward to seeing it put together. I love those sweater dryer things! Mine is always out! OK. Back now. Had to buy a couple of those pop-up sweater dealies. I’ve bookmarked the ribbons for later. Beautiful, well thought out job as always. I totally admire your skill. I don’t comment very often, but I read your blog regularly. I think you are way cool, but I gotta say, your reasons for knitting sweaters in pieces aren’t swaying me. I’m all for the least number of seams possible. I’m not a weaver, I’m a knitter. Why sew when you can knit? But that’s what great about knitting, it has something for everyone. Oh, definitely the grosgrain! It’s such a classic feature, and so fun because only you can see it. Almost like wearing really cute underwear just because. you have a weird esp on my mind… i am was just contemplating today about whether or not i should block my sleeves and body before seaming them in… i just got my answer! Thank you. No pins? I’m still new to this blocking concept, don’t you need to shape it and use pins?? I’ve been eyeing the Finishing Techniques for Hand Knitters as well. If you’re going to spend ALL THAT TIME knitting, why not put in a little more to make the garment heirloom-quality (as if it isn’t already)? What is the consensus on the book, y’all? Worth it? Beautiful project – thanks for walking thru the thought process – are you going to share seaming tips? Ha–my father lost a spelling bee with the word ‘grosgrain’ so it always makes me laugh. He forgot the silent ‘s’. I think ribbon would be suitably retro, tons of vintage sweaters employ this technique. Have you seen Erika Knight’s new book Glamour Knits? She has a fully lined cardigan, another touch I see in a lot of vintage cardigans. I’ve seen most of them at The Garment District in Kendell Square but most of them are 100% acrylic and I leave them there. Still, they’re inspiring. It looks wonderful! the front edges are so even. Love the ribbon idea. Much less hassle, but it still gives you that tailored look. You’ve been so productive lately–I admire that! This sweater seems to have been finished in the blink of an eye. Interesting to hear your views on blocking – it’s always nice to get another point of view! Thanks for the pointer to that book. I added it to my wishlist! 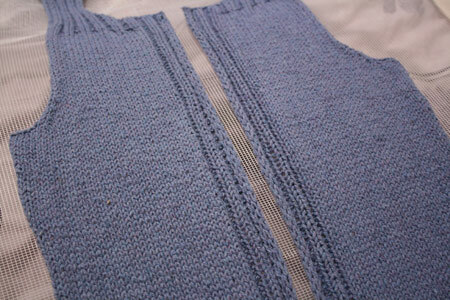 I also blocked and seamed last night – now I’m knitting the collar. I like to block the pieces to be seamed, so I can make sure they (ahem) line up. And then I do another soak when it’s done. But I’ve only done baby size sweaters…. i always steam block each piece of a sweater and sew them together as i go along! and i’m a long time lurker, by the way! With a zipper, the zipper itself is the stablizer for the front edges. The only reason for a facing is to hide the zipper. Have you ever considered lining the entire sweater–that also hides the zipper and avoids the “triple layer of cloth” sewed right down the front–the effect of a zipper (layer 1) AND a ribbon (layer 2) sewed behind the sweater fabric (layer 3). Lining is also a third layer, it is true, but it isn’t sewed down right over tummy and other parts. If you do think of a lining, use the sweater pieces as the pattern guide and make each piece pretty substantially bigger than it seems you should have to–to provide room for the sweater to stretch. Sew a tuck of extra length in above the bottom band also. Another lining trick: use that grosgrain ribbon to stablize the shoulder seam. I’ve made several lined sweaters, and they are very long lasting garments. Silk is a nice lining material, but ordinary polyester lining works too…good luck with your project! Looking forward to seeing how it comes out. So loving your ribbon idea! Your Brilliant Retro is looking great! I think that I’m going to have to invest in some of those sweater dryer things. They look like they are very useful. Can’t wait to see how it all looks when it’s finished. Ribbon is definitely the way to go.